Water-conserving rain barrels, nearly free! If you’re trying to save water for your garden or lawn, this is a great deal that comes up every once in a while. You buy rain barrels at a reduced rate, you install them at your house. Often a local official comes to check that you have installed them. In some towns such as Santa Monica, you must annually confirm your continued use of the barrels. The really good part is that a week or two after you have installed the barrels, you get reimbursed the cost up to $100/barrel, 4 barrels maximum, for your expense! I installed three barrels three years ago and I haven’t used municipal water since then for my numerous potted plants. It also provides enough water for my compost box most years. You will probably have to do a little modification on some of your roof /gutter downspouts, but I bet you’ll be surprised how much fog drip you will also collect in the non-rainy season. The barrels cost $94-139 if bought from their website, the same price range as nearly every other rain barrel outlet. But you can pre-order and pre-pay $85 each for them and pick them up at one of their “events.” This must be done no later than the Wednesday prior to the event you’d like to attend. If they have extra barrels on hand, they bring them to the event. The event gives you all the information you need to start saving water. Their next event in the Santa Monica area is Sat., 11/7/15, 12-1:30 PM, at the Tree People HQ, 12601 Mulholland Dr., on the valley side (north) of Mulholland at Franklin Canyon Drive. If you want to get some rain barrels at this event, you must prepay no later than Weds. 11/04. Directions! 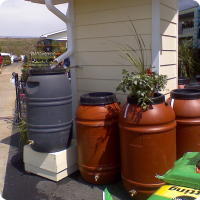 [NOTE from Chuck Almdale] We picked up 4 terra-cotta colored 58-gallon rain barrels on 10/24/15 at the Tree People “event.” They distributed the barrels, gave out some informative fliers and off we went. There was no slide-show presentation. All of the barrels we use are recycled food grade barrels we purchase before they are disposed of into landfills. It is a WIN – WIN situation all the way around. Please help our environment by not only saving water, but by keeping these barrels out of landfills.